Your Orthodontist in Weatherford Straightens Smiles! The perfect time to get orthodontics is around age ten. The mouth has matured, but it’s still easy enough to manipulate teeth into a straight smile. 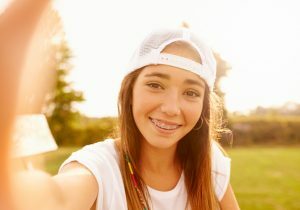 The American Dental Association reports that most patients that need orthodontic treatments are between the ages of twelve and fifteen years old, but braces aren’t just limited to adolescents. In fact, more than one million people in North America—adults and children alike—had braces in 2015. Your new orthodontist in Weatherford, whether it be Dr. Deborah Romack or Dr. Garret Mulkey, provides complete orthodontics for children and adults. Our office is a one-stop shop for great smiles! What exactly is traditional orthodontics? Everyone would like a straight, strong smile that will serve them well for years to come. When you’re looking to make corrections to a crooked smile, uneven bite, or obvious crowding or spacing issues, traditional orthodontics may be the right choice for you. Braces have been an option for straightening smiles for a long time because they’re effective and provide long-lasting results. Three main components help to guide your teeth into their correct places: brackets, thin metal wires, and elastics. Fortunately, today’s braces are much smaller and more comfortable than those in the past. There are even ceramic, or tooth-colored brackets and elastics, to help camouflage your straightening treatment for a more polished look. How can you benefit from traditional braces? Why should you choose Cosmetic and Family Dentistry of Weatherford? Few general dentists provide orthodontics treatments. While some offer quicker alternatives like aligners, our dentists offer traditional orthodontic treatment in Weatherford for adolescents and adults alike. We are one of few local general dentistry practices that offers these services on top of our other comprehensive services. Our dentists are members of the International Association of Orthodontics and have over 500 hours of continuing education in the field. Our dentists are so knowledgeable that they have even instructed orthodontic courses for fellow dentists. If your family resides in Weatherford or any surrounding areas like Aledo, Brock, Millsap, or Springtown, we’re here to serve your dental care needs. To learn more about the various types of orthodontic treatments offered at Cosmetic and Family Dentistry of Weatherford, give us a call! by: Dr. Deborah Romack at March 7, 2017 . Comments Off on Your Orthodontist in Weatherford Straightens Smiles!